Successful Brits in Toronto are like the buses in the city: every-bloody-where! And you thought we were going to riff on this tweet, right? Monster, Workopolis, Charity Village, agencies — you name it! Endless sending of CVs with no reply. It took around four months to get a proper job, and when I did, the manager loved England so it helped me on the experience side I think. A few years on and I’m at Ryerson and it’s a great place to work. Best: So many restaurants from all cuisines and poutine! The summers are great, and I don’t really mind the winters as you can ski and skate. 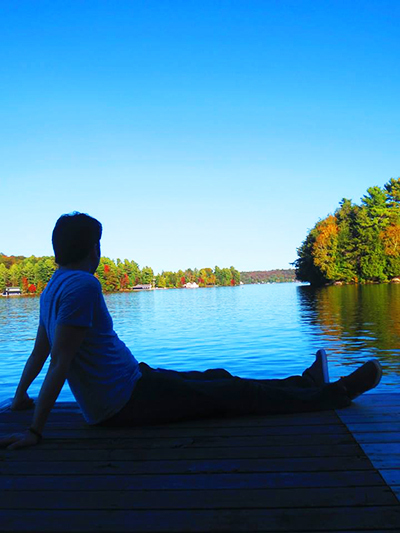 Also, travelling to Muskoka in the autumn. Worst: Tipping and the cost of going out. The TTC network should be better for a major city — who wants to take a subway, a streetcar and a bus in one journey?! I wouldn’t say I’ve made the effort; I’ve found that initially Brits are suspicious of other Brits over here, but once you get chatting you can bond over the weird bits of Canadian life. Buy a proper winter coat. I only bought mine to stop people asking me, “OMG, is that your winter coat?” … but it was a good decision. Get involved in Canadian pasttimes: hockey, skating, pumpkin picking — if you’re going to live here, you may as well embrace it! This entry was posted in Uncategorized and tagged brits in toronto, patrick o'donoghue, successful brits in toronto on March 6, 2015 by britsintoronto.